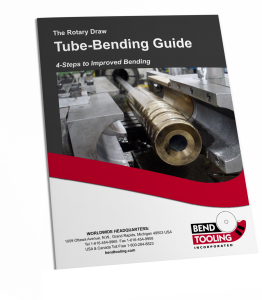 captive lip — A design for bend dies only; this is a true cavity for round tubing with flats (i.e., the lip) at the top and bottom of the cavity extending past the vertical centerline of the cavity. These flats have the effect of “capturing” the tube inside the bend die and mildly compresses it towards the plane of bend. This compression helps the tube resist flattening of the outside radius of the bend and wrinkling of the inside radius. This design is generally to be preferred, but it is not recommended for very thin-walled tubes or tubing materials with a high content of chromium, nickel, or other alloys with poor plasticity at the point of bend. no-lip or plain — A true cavity design without the flats described above. The face of the bend die block containing a no-lip cavity is usually offset one percent of the tube outside diameter from the centerline of the cavity, and the faces of clamp and pressure die blocks are usually offset one to three percent. This type of cavity should be specified if maximum containment of the tube at the point of bend is required, as is the case with extremely thin-walled and rigid materials. heart-shaped — Also known as the non-mandrel, elliptical, or empty-bend cavity. The heart-shaped cavity, like the captive lip, compresses the tube towards the plane of bend but more so. The heart-shaped cavity approximates the ellipse a round tube of a given diameter becomes if flattened. The further a tube is flattened, the more elliptical its shape, and so the greater is its resistance to deformation at the point of bend. The objective of the heart-shaped design is to create sufficient resistance to eliminate the need for mandrel and wiper tooling. The heart-shaped cavity is most effective for bend applications in which the wall factor is 20 or less, the “D” of bend is 2 or greater, and the depth of bend is less than 90 degrees. tapered leaf cavity — This is a cavity design for square and rectangular tubing. True cavity designs for these shapes have the significant disadvantage of causing the tube to stick in the die after forming. Increasing the relief allowance does not help because the tube is then not sufficiently contained to form properly. The tapered leaf cavity eliminates this problem by tapering the top leaves of the mating dies so that when closed a true cavity is created, but when open the cavity size is enlarged so that the tubing material is freely removed from the die.